Meet the writers and influencers behind the scenes - reporting on everything from new restaurant openings, the best cocktails in town, travel, and much, much more. Interestingly enough, all these ladies live within very close proximity of one another in the Western Addition and Haight-Ashbury. Today, the term "Western Addition" is commonly used today to describe the area from Van Ness Avenue on the east, Masonic on the west, California Street on the north, and Fell or Oak Street on the south. From there, it's divided into smaller micro neighborhoods such as Lower Pacific Heights, Cathedral Hill, Japantown, the Fillmore, Hayes Valley, Alamo Square, Anza Vista, and North Panhandle. The Western Addition has an interesting history, specifically the Fillmore district which has gone through significant changes, development, gentrification. If you're interested to learn more, I highly recommend reading Cool Gray City of Love: 49 Views of San Francisco by SF Magazine's Gary Kamiya, specifically the chapter titled "The Haunted House." What do you love about it? So much has changed over the past couple decades (for better and for worse) but I do love seeing Divisadero so vibrant and lively—it always has something going on. (I just hope Eddie’s hangs on forever.) All our pre-1906 quake Edwardians and Queen Annes are pretty magnificent. I walk through the Panhandle and Golden Gate Park for exercise, and can’t believe I’m so close to that beautiful park—and Alamo Square! I also love my access to three great markets and the people who work there (Bi-Rite Market, Falletti’s, and our Sunday farmers’ market), a bunch of cafés (I’ll go to Matching Half when I’m not making an espresso at home), and I’m incredibly lucky to have my sister living down the street. Seriously, that is gold. Would you want to live anywhere else in the city? I always wish I lived in North Beach for a bit in my twenties, but I’ll probably live longer since I didn’t. My liver would have had a workout. Where do you eat in your neighborhood? Green Chile Kitchen and Nopalito see a fair amount of me, same with 4505 Burgers & BBQ; happy to welcome Namu Stonepot and Bar Vale to the ’hood, love the salads and Amatriciana pizza at Ragazza, Indian brunch at Indian Paradox, and a shout out to Little Star Pizza, Nopa, and Bar Crudo for holding it down so long, so well! What do most people NOT know about your neighborhood? It offers a good balance of city life with nature because of the access to the park—I sometimes hear owls, and there’s a coyote roaming the neighborhood right now! What’s your go to weeknight meal? I’m such a pasta queen. I love perfecting my bucatini all’amatriciana or cacio e pepe. Big on soups over here too. What’s in your dream kitchen? I wish I had room for a bar and large, round dining table so I could gather my friends. I live in the tiniest top- floor studio, so I can’t entertain like I’d like to. Check out the best of what's for sale in the broader Western Addition and the Haight Ashbury HERE in Emily's curated Compass Collection, and reach out to Emily to view any of these homes. Over her career, Virginia Miller has dined at over 10,000 restaurants & bars and counting - so you could say she knows a thing or two about good eats (and drinks). 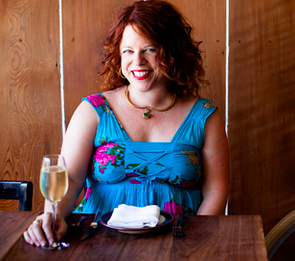 Miller is a former editor for Zagat, Table8, and food critic for the Bay Area Guardian, and has judged countless cocktail, spirits, dining and cooking competitions. In her free time she consults, teaches classes, and travels the world. Currently you can find her at Time Out, Liquor.com and The Perfect Spot. What do you love about it? As a lifelong vintage dresser and music lover, even in my SoCal/LA days, I would drive up to SF to shop for vintage clothing in the Haight and buy records and CDs at Amoeba (this was before Hollywood finally got a location). Back then, I never imagined I’d live around the corner from the best record store in the world. The rich musical and revolutionary history of my ‘hood' is legend: Summer of Love, the density of musicians living within a few blocks of each other, the likes of Hendrix playing free shows in the Panhandle behind my house. Such a heritage inspires a passionate music lover like myself. Upper Haight is unexpectedly a live music gem, namely because of SF’s best jazz bar since the 1980s, Club Deluxe, a low-key, retro gem of a bar that always somehow has a seat for you even when packed. They bring in top-notch local musicians every night playing everything from blues to bossa nova. It’s intimate and similar to my favorite bars in New Orleans where killer music rarely costs more than a drink and impromptu dancing is known to break out. There are an array of shows at tiny Milk Bar, and famous musicians doing free shows at Amoeba — I’ll never forget seeing the great soul singer Solomon Burke soulfully bellow from his wheelchair not long before he passed away. To further up the music game, Golden Gate Park often hosts an array of free concerts, from the Symphony to the Opera, just blocks from my house, as well as major festivals like Outside Lands and Hardly Strictly Bluegrass, which have allowed me to see everyone from Paul McCartney to Kanye, and the likes of Dolly Parton, Indigo Girls, Bonnie Raitt and Elvis Costello for free, essentially in my backyard. Then there are the parks. Upper Haight/Cole Valley is a beautiful mix of nature and city with the Panhandle just behind my house and Golden Gate Park at my doorstep, rolling on to the Pacific Ocean. Another big benefit? Upper Haight is right in the center of the city, making it an easy, quick trek to almost anywhere. Whether downtown, Golden Gate Bridge, the ocean or the Mission, nothing takes much more than 10-15 minutes to drive to. Would you want to live anywhere else in the city? I lived in Noe Valley and the Mission my first eight years in the city and at times I really miss those neighborhoods. For years, I thought I wouldn’t live anywhere else but that central part of SF. It still feels like home when I am back on cozy 24th and Noe, where my last home was, cradled by Twin Peaks. But the longer I am in the Haight-Ashbury, the more I can’t imagine living without the mix of city and nature. The Haight’s older 1800’s architecture is a treasure, as is the proximity of the Panhandle and stunning Golden Gate Park, both one block from my house on Page St. Alternately, I can round the corner to Haight St. for food, drink, shopping, hustle, live music, or I can picnic on a lush green meadow, rowboat on Stow Lake, take in world class art the De Young Museum or get lost in a redwood grove in Golden Gate Park. Alembic, always, for cocktails and food since it opened over a decade ago. It was one of the plusses for me in moving to the neighborhood. Same with beers and the underrated brunch at Magnolia Brewing. I live right on the edge of cozy Cole Valley, where I get coffee and irresistible salted tahini dark chocolate chip cookies at Wooden Cafe. I stock up on Morello cherry and coconut milk-dark chocolate-salted almond ice creams at Ice Cream Bar — their old world (late 1800s- 1940s-inspired) soda fountain is a rarity anywhere. Padrecito is my modern Mexican food favorite — one of the best in the city, with a great agave spirits/cocktail bar to boot. For takeout, I frequently get Middle Eastern wraps from Taboun, fantastic Iraqi dips and perdaplow from Jannah, Parada 22 for Puerto Rican food, Ginza for sushi or slices from Escape to New York Pizza and Tony’s Slice House. What do most people NOT know about your neighborhood? The aforementioned Club Deluxe still seems to be a jazz club those outside the neighborhood often aren’t aware of, a destination-worthy live music spot for sure. I am a 1940s-1960s girl all the way and the Haight has long been known for its vintage shopping. But not everyone seems to know that Upper Haight is also the SF neighborhood for urban streetwear clothing and shoe shopping, with a slew of minimalist hip hop and urban fashion shops along Haight St. that often draw lines down the block when a designer is there for a new release. How do you cook and entertain at home? My kitchen is lined with a couple hundred + bottles and I am constantly making different cocktails for friends and family. I always like to try out or create new recipes though some of my regular go-to's are an aquavit martini or sherry or vermouth cocktails. I can’t live without my extensive collection of cookbooks, where I always find inspiration, even when I don’t follow a recipe exactly. And my glassware: I have glassware for just about every circumstance, from absinthe to sake glasses (and plenty of vintage glassware besides). A big island to work from in the middle, a vintage Italian espresso machine and a vintage bar (ideally from the 1930’s or 40’s) from which to make my cocktails. Sarah Chorey is a Bay Area native, creator of sarahcraves.com and the popular Instagram account Eat This SF. She's always on the hunt for the next best meal and thinks pugs are the perfect animal. Check out her work at 7x7. What do you love about it? My favorite thing about NoPa is the bustling food scene and energetic, yet low-key neighborhood vibes. I specifically knew I wanted to move to NoPa for the sense of community you feel when you're there and the explosion of delicious eats it has had in recent years -- 4505 Meats & BBQ, Sightglass, The Mill, NOPA, Ragazza, Nopalito, Souvla, Horsefeather, Little Star and Brenda's are just a few of my favorites! It's also completely walkable to some of my other favorite neighborhoods -- Lower and Upper Haight, even Hayes Valley if you're willing to brave the hill up to Alamo Square and over. I think it would be interesting to live in North Beach, there's tons of great restaurants, night life, parks, and culture there. Plus, I always love popping over for a visit to Chinatown or a day at the Ferry Building. The Mill has delicious pizza nights (crazy good + delicious deal)! We also have great under-the-radar ice cream I feel like most people forget about -- shaved sno at Powder, BiRite ice cream at the market (you don't just have to go to the Mission to get it! ), and amazing soft serve at Souvla (I always get the baklava chunks added in!). We also have an awesome farmer's market every Sunday that adds to our amazing neighborhood. I'm not a huge cook, but one of my favorite meals is a homemade burger -- I'm always requesting my boyfriend to whip them up for me! If I'm on my own, I keep it simple with avocado toast made with ACME olive bread and a heavy sprinkling of Trader Joe's Everything Seasoning. I would love a wine cellar/built-in giant floor-to-ceiling wine refrigerator, white marble countertops and a nice big center island. Check out what's for sale in the broader Western Addition area and the Haight Ashbury HERE, and reach out to Emily to view any of these homes.